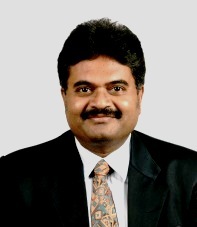 Dr.Anil - Marketing Musings: 20th article published in HANS INDIA today (25th October 2014) It is titled "World's best Promotions - The Power of the Punch". 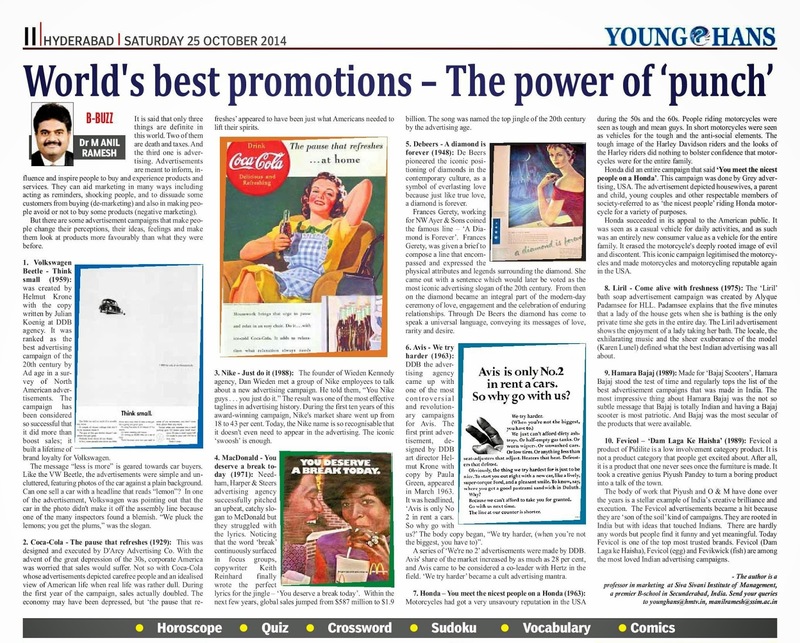 20th article published in HANS INDIA today (25th October 2014) It is titled "World's best Promotions - The Power of the Punch". It is said that only three things are definite in this world. Two of them are death and taxes. And the third one is advertising. Advertisements are meant to inform, influence and inspire people to buy and experience products and services. 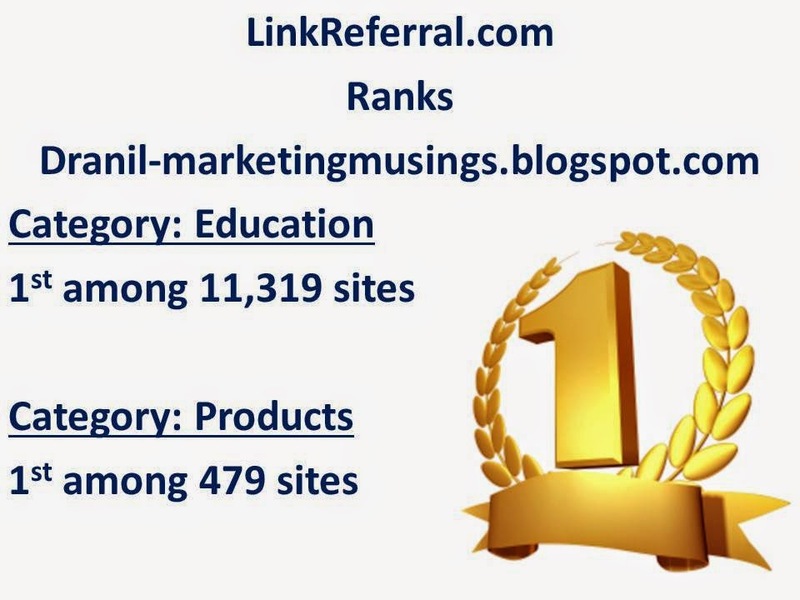 They can aid marketing in many ways including acting as remainder, shocking people, and to dissuade some customers from buying (de-marketing) and also in making people avoid or not to buy some products (negative marketing). But there are some advertisement campaigns that make people change their perceptions, their ideas, feelings and make them look at products more favorably than what they were before. 1. Volkswagen Beetle - Think Small (1959): was created by Helmut Krone with the copy written by Julian Koenig at DDB agency. It was ranked as the best advertising campaign of the twentieth century by Ad age in a survey of North American advertisements. The campaign has been considered so successful that it did more than boost sales, it built a lifetime of brand loyalty for Volkswagen. The message "less is more" is geared towards car buyers. Like the VW Beetle the advertisements were simple and uncluttered, featuring photos of the car against a plain background. Can one sell a car with a headline that reads "Lemon”? In one of the advertisement, Volkswagen was pointing out that the car in the photo didn't make it off the assembly line because one of the many inspectors found a blemish. "We pluck the lemons; you get the plums," was the slogan. 2. Coca-Cola - The pause that refreshes (1929): was designed and executed by D'Arcy Advertising Co. With the advent of the great depression of the thirties corporate America was worried that sales would suffer. Not so with Coca-Cola whose advertisements depicted carefree people and an idealized view of American life when real life was rather dull. During the first year of the campaign, sales actually doubled. The economy may have been depressed, but "the pause that refreshes" appeared to have been just what Americans needed to lift their spirits. 3. Nike - Just do it (1988): The founder of Wieden Kennedy agency, Dan Wieden met a group of Nike employees to talk about a new advertising campaign. He told them, "You Nike guys . . . you just do it." The result was one of the most effective taglines in advertising history. During the first ten years of this award-winning campaign, Nike's market share went up from 18 to 43 percent. Today, the Nike name is so recognizable that it doesn't even need to appear in the advertising. The iconic "swoosh" is enough. 4. MacDonald - You deserve a break today (1971): Needham, Harper & Steers advertising agency successfully pitched an upbeat, catchy slogan to McDonald but they struggled with the lyrics. Noticing that the word "break" continuously surfaced in focus groups, copywriter Keith Reinhard finally wrote the perfect lyrics for the jingle “You deserve a break today”. Within the next few years, global sales jumped from $587 million to $1.9 billion. The song was named the top jingle of the 20th century by Advertising age. 5. Debeers - A diamond is forever (1948): De Beers pioneered the iconic positioning of diamonds in the contemporary culture, as a symbol of everlasting love because just like true love, a diamond is forever. Frances Gerety, working for N.W.Ayer & Sons coined the famous line "A Diamond is Forever". Frances Gerety, was given a brief to compose a line that encompassed and expressed the physical attributes and legends surrounding the diamond. She came out with a sentence which would later be voted as the most iconic advertising slogan of the 20th century. From then onwards the diamond became an integral part of the modern-day ceremony of love, engagement and the celebration of enduring relationships. Through De Beers the diamond has come to speak a universal language, conveying its messages of love, rarity and desire. 6. Avis - we try harder (1963): DDB the advertising agency came up with one of the most controversial and revolutionary campaigns for Avis. The first print advertisement, designed by DDB art director Helmut Krone with copy by Paula Green, appeared in March 1963. It was headlined, "Avis is only No. 2 in rent a cars. So why go with us?" The body copy began, "We try harder. (When you're not the biggest, you have to.)" A series of "We're No. 2" advertisements were made by DDB. Avis' share of the market increased by as much as 28%, and Avis came to be considered a co-leader with Hertz in the field. "We try harder" became a cult advertising mantra. 7. Honda – You meet the nicest people on a Honda (1963): Motorcycles had got a very unsavory reputation in the USA during the 50s and the 6os. People riding motorcycles were seen as tough and mean guys. In short motorcycles were seen as vehicles for the tough and the anti-social elements. The tough image of the Harley Davidson riders and the looks of the Harley riders did nothing to bolster confidence that motorcycles were for the entire family. Honda did an entire campaign that said ‘you meet the nicest people on a Honda’. This campaign was done by Grey advertising, USA. The advertisement depicted housewives, a parent and child, young couples and other respectable members of society-referred to as "the nicest people" riding Honda motorcycle for a variety of purposes. Honda succeeded in its appeal to the American public. It was seen as a casual vehicle for daily activities, and as such was an entirely new consumer value as a vehicle for the entire family. It erased the motorcycle's deeply rooted image of evil and discontent. This iconic campaign legitimized the motorcycles and made motor cycles and motorcycling reputable again in the USA. 8. Liril - Come alive with freshness (1975): The "Liril" bath soap advertisement campaign was created by Alyque Padamsee for HLL. Padamsee explains that the five minutes that a Lady of the house gets when she is bathing is the only private time she gets in the entire day. The Liril advertisement shows the enjoyment of a lady taking her bath. The locale, the exhilarating music and the sheer exuberance of the model (Karen Lunel) defined what the best Indian advertising was all about. 9. Hamara Bajaj (1989): made for "Bajaj Scooters". Hamara Bajaj stood the test of time and regularly tops the list of the best advertisement campaigns that was made in India. The most impressive thing about Hamara Bajaj was the not so subtle message that Bajaj is totally Indian and having a Bajaj scooter is most patriotic. And Bajaj was the most secular of the products that were available. 10. Fevicol – Dam Laga Ke Haisha (1989). Fevicol a product of Pidilite is a low involvement category product. It is not a product category that people get excited about. After all, it is a product that one never sees once the furniture is made. It took a creative genius Piyush Pandey to turn a boring product intro a talk of the town. The body of work that Piyush and O & M have done over the years is a stellar example of India’s creative brilliance and execution. The Fevicol advertisements became a hit because they are "son of the soil" kind of campaigns. They are rooted in India but with ideas that touched Indians. There are hardly any words but people find it funny and yet meaningful. Today Fevicol is one of the top most trusted brands. Fevicol (dam Laga ke Haisha), Fevicol (egg) and Fevikwick (fish) are among the most loved Indian advertising campaigns.